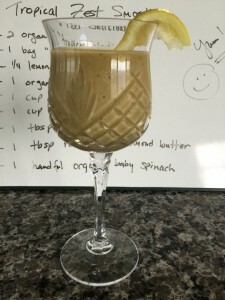 Delicious and easy, this healthful breakfast smoothie is made from apples, carrots, lemon, frozen tropical fruit, spinach, and more! Put all ingredients in the Vitamix or other high-speed blender. Great for breakfast; kids love it, too!